We’ve lived less than three blocks from Newtowne Grille for nine months now, and since we’re not townies or college students, we’ve so far elected not to go in. We’re past the days that we need a $12 pitcher of beer and a $4 pizza…okay, that’s a big fat lie. But when Christopher’s is marginally closer and 1000% better, we just can’t be accountable for never going. 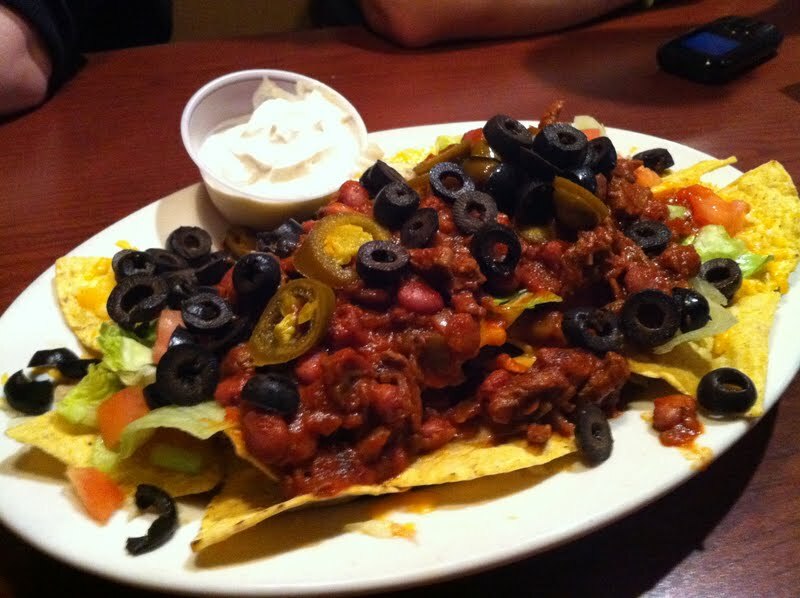 Given the sorry state of the nachos, we might be completely justified. Appearance: (5) The photo here does this particular plate too much justice, but trust us, the tomatoes were wan and the cheese pre-congealed. The chili looked delicious, but god damnit there was lettuce! Cue a very passionate out-loud groan. Quality: (2) We don’t even know where to begin. First of all, we liked the chili. The chunks of meat were ample and not of the ground-beef variety. The extent of our compliments need to end there, because the only other part of these nachos that didn’t make us cry was the lettuce (and black olives! -ed). That should tell you a lot about the quality. The chips were absolutely the stalest we have ever encountered. Our Guest Correspondent Tim described them as cardboard, which is probably as apt a metaphor as we can give you to describe the stale, soft, and salty foundation of our chos. Normally when you bite into a chip you expect a bright crunching sound. When you bit in to these chips, it sounds a little bit like shattering safety glass. We wondered aloud, what happened to these? Had someone accidentally left a bag of chips open since last summer and then tried to make nachos with them?? Louder groan! Distribution: (5) The cheese was cold even before it got to our table, making it very hard for it properly coat the chips. The chili was ladled with a heavy hand but unfortunately, only on the very top of the chips, leaving many naked below. This worked to our advantage as it was easier to spoon off and avoid the abominable chips, but that really doesn’t deserve extra points! Price: (5.5) At $10, why not just pay a dollar more and go for the $11 pitcher-of-PBR-and-pizza deal, and save yourself the jaw-numbing, soul-crushing apocalypse that is these nachos?? Really. Save yourself. Here’s a question: how long do these nachos have to go un-ordered before Newtowne takes them off the menu? Three months? Six? We, say, however long as it takes. People of the world, unite! Boycott this disaster! Down with stale chips! Viva la PBR and pizza instead!